Download "www.cms.hhs.gov/mandatoryinsrep/01_overview.asp INTRODUCTION October 1, 2010." 1 1. INTRODUCTION Recent changes in federal law represent a sea change in the consideration that must be given by defendants to the interests of Medicare. 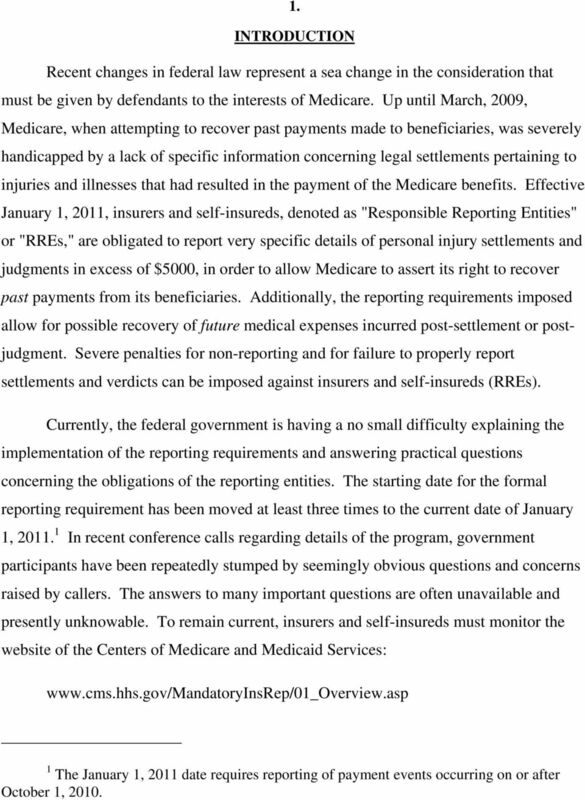 Up until March, 2009, Medicare, when attempting to recover past payments made to beneficiaries, was severely handicapped by a lack of specific information concerning legal settlements pertaining to injuries and illnesses that had resulted in the payment of the Medicare benefits. 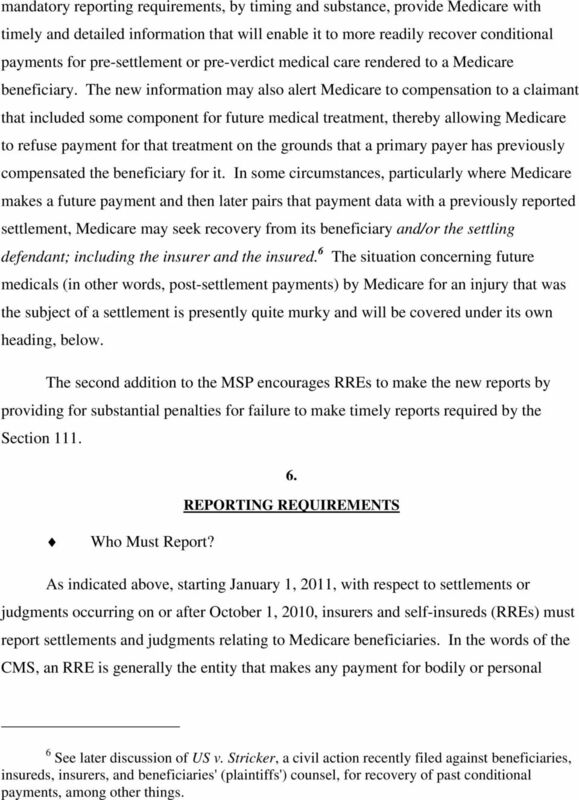 Effective January 1, 2011, insurers and self-insureds, denoted as "Responsible Reporting Entities" or "RREs," are obligated to report very specific details of personal injury settlements and judgments in excess of $5000, in order to allow Medicare to assert its right to recover past payments from its beneficiaries. Additionally, the reporting requirements imposed allow for possible recovery of future medical expenses incurred post-settlement or postjudgment. Severe penalties for non-reporting and for failure to properly report settlements and verdicts can be imposed against insurers and self-insureds (RREs). Currently, the federal government is having a no small difficulty explaining the implementation of the reporting requirements and answering practical questions concerning the obligations of the reporting entities. The starting date for the formal reporting requirement has been moved at least three times to the current date of January 1, In recent conference calls regarding details of the program, government participants have been repeatedly stumped by seemingly obvious questions and concerns raised by callers. The answers to many important questions are often unavailable and presently unknowable. To remain current, insurers and self-insureds must monitor the website of the Centers of Medicare and Medicaid Services: 1 The January 1, 2011 date requires reporting of payment events occurring on or after October 1, 2010. 2 2. 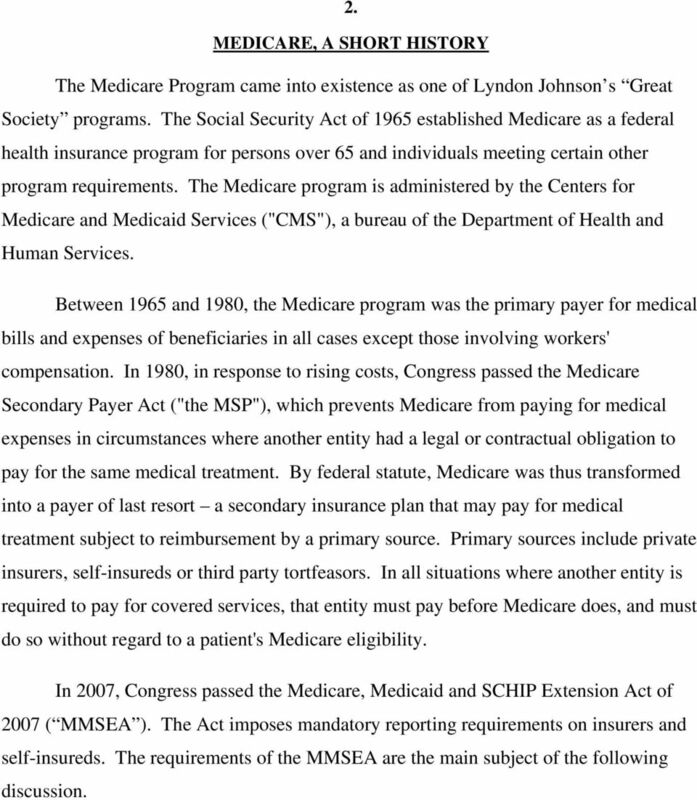 MEDICARE, A SHORT HISTORY The Medicare Program came into existence as one of Lyndon Johnson s Great Society programs. The Social Security Act of 1965 established Medicare as a federal health insurance program for persons over 65 and individuals meeting certain other program requirements. The Medicare program is administered by the Centers for Medicare and Medicaid Services ("CMS"), a bureau of the Department of Health and Human Services. Between 1965 and 1980, the Medicare program was the primary payer for medical bills and expenses of beneficiaries in all cases except those involving workers' compensation. In 1980, in response to rising costs, Congress passed the Medicare Secondary Payer Act ("the MSP"), which prevents Medicare from paying for medical expenses in circumstances where another entity had a legal or contractual obligation to pay for the same medical treatment. By federal statute, Medicare was thus transformed into a payer of last resort a secondary insurance plan that may pay for medical treatment subject to reimbursement by a primary source. Primary sources include private insurers, self-insureds or third party tortfeasors. In all situations where another entity is required to pay for covered services, that entity must pay before Medicare does, and must do so without regard to a patient's Medicare eligibility. In 2007, Congress passed the Medicare, Medicaid and SCHIP Extension Act of 2007 ( MMSEA ). The Act imposes mandatory reporting requirements on insurers and self-insureds. The requirements of the MMSEA are the main subject of the following discussion. 3 3. MEDICARE ELIGIBILITY It is essential to understand who, exactly, might be a Medicare beneficiary. This is critically important since the beneficiary status of the claimant or plaintiff triggers the requirement that settlements and judgments be reported to the CMS. Where it is known that a claimant received Medicare payments for an injury or condition at issue in the litigation or claim, the obligation to take Medicare s reimbursement interests into account presently exists. In general, persons over age 65 are eligible to receive Medicare benefits. This does not necessarily mean that such a person actually received any benefits from Medicare for an injury or illness related to the litigation. The Code of Federal Regulations currently defines a beneficiary as a person who is entitled to receive benefits and also as [an individual who] meets all of the requirements for Medicare benefits. 2 A person over the age of 65 might not have made a claim to Medicare for injuries involved in the claim or suit, due to the existence of private insurance or for some other reason. The failure of the claimant to make a claim to Medicare for an injury or illness, or to even sign up for Medicare in the first instance, does not make the claimant ineligible to receive Medicare benefits. If the person otherwise qualifies, they are still considered Medicare eligible and, by definition, a beneficiary. In other words, a Medicare beneficiary may not have received anything at all from Medicare, but the duty to report still exists. A person aged 65 or older is highly likely Medicare eligible and a beneficiary. 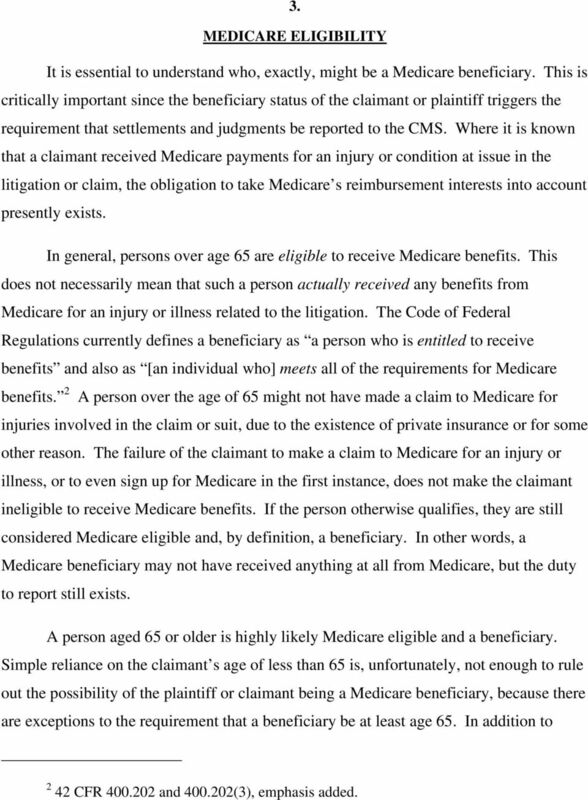 Simple reliance on the claimant s age of less than 65 is, unfortunately, not enough to rule out the possibility of the plaintiff or claimant being a Medicare beneficiary, because there are exceptions to the requirement that a beneficiary be at least age 65. In addition to 2 42 CFR and (3), emphasis added. 4 some extremely serious medical conditions such as total kidney failure, a very significant exception to the age 65 requirement is one that authorizes benefits for anyone of any age receiving Social Security disability benefits for a period of at least 24 months. In other words, a very young person who is severely disabled and receiving Social Security disability benefits could well be a Medicare beneficiary, triggering the reporting requirement. 3 In general, the following should be taken as strong indicators that a claimant or plaintiff is a Medicare beneficiary: A. Claimant is at least age 65; B. Claimant of any age is severely disabled and possibly receiving Social Security disability benefits; C. Claimant of any age has end stage renal disease; D. Claimant of any age has Lou Gehrig s Disease. The CMS does not require insurers and self-insureds (RREs) to rely on a claimant s representations -- or their own guess work to determine whether a particular claimant is, in fact, a Medicare beneficiary. 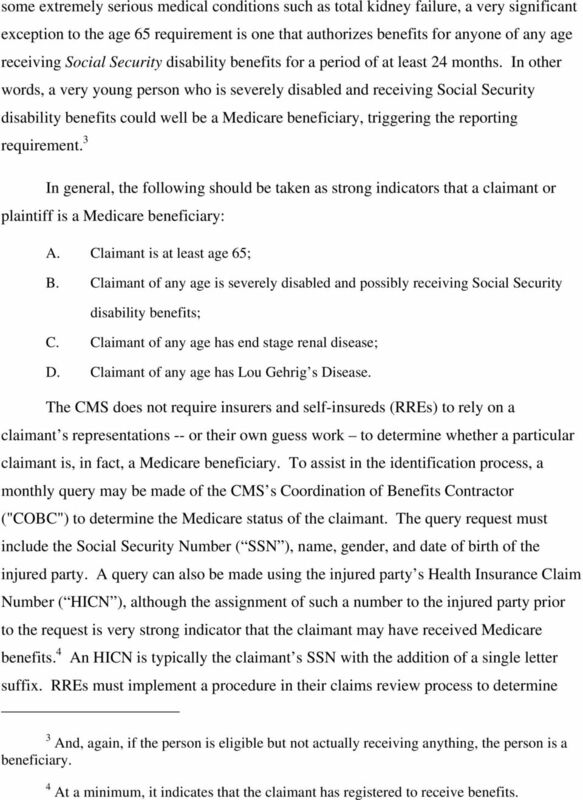 To assist in the identification process, a monthly query may be made of the CMS s Coordination of Benefits Contractor ("COBC") to determine the Medicare status of the claimant. The query request must include the Social Security Number ( SSN ), name, gender, and date of birth of the injured party. A query can also be made using the injured party s Health Insurance Claim Number ( HICN ), although the assignment of such a number to the injured party prior to the request is very strong indicator that the claimant may have received Medicare benefits. 4 An HICN is typically the claimant s SSN with the addition of a single letter suffix. RREs must implement a procedure in their claims review process to determine beneficiary. 3 And, again, if the person is eligible but not actually receiving anything, the person is a 4 At a minimum, it indicates that the claimant has registered to receive benefits. 5 whether an injured party is a Medicare beneficiary and to gather the information necessary for Section 111 reporting. 4. CONDITIONAL PAYMENTS The phrase conditional payments is frequently used by the CMS. The term has confused many people who do not understand the secondary payer aspect of Medicare as a result of the changes occurring in After 1980, payments made by Medicare are always subject to recovery from primary payers. In that sense, Medicare considers all its payments conditional because, if a primary payer (insurer or tortfeasor) can be found, Medicare can seek to recover its prior payments made to the beneficiary. For some, conditional payments may be more easily understood as simply amounts Medicare has paid for treatment of an injury before judgment or settlement. To make it easier still, conditional payments are essentially past medicals. 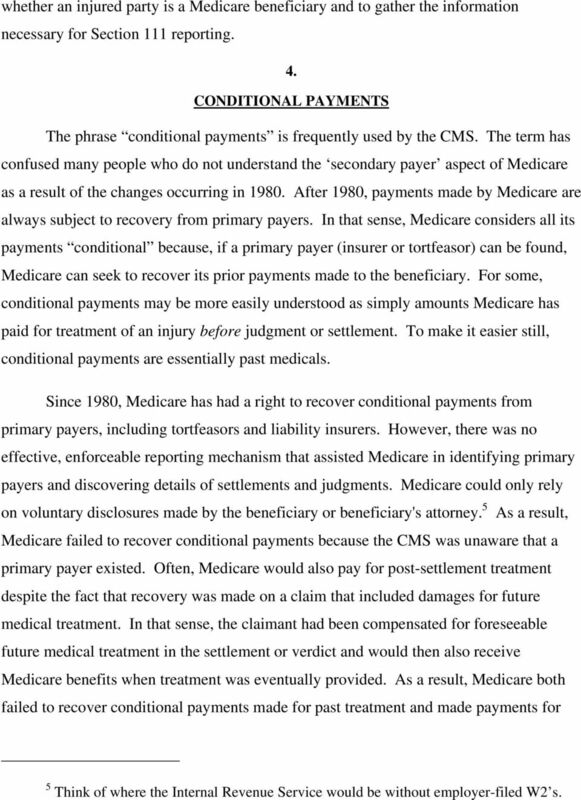 Since 1980, Medicare has had a right to recover conditional payments from primary payers, including tortfeasors and liability insurers. However, there was no effective, enforceable reporting mechanism that assisted Medicare in identifying primary payers and discovering details of settlements and judgments. Medicare could only rely on voluntary disclosures made by the beneficiary or beneficiary's attorney. 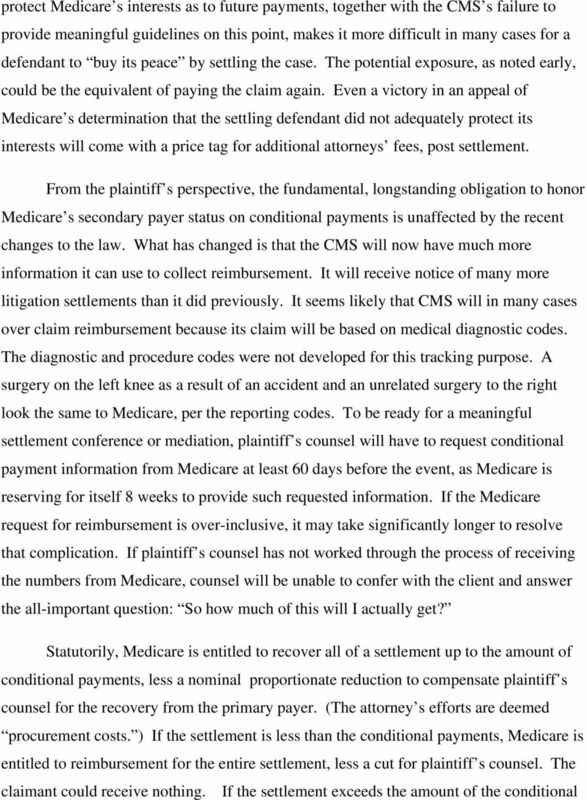 5 As a result, Medicare failed to recover conditional payments because the CMS was unaware that a primary payer existed. Often, Medicare would also pay for post-settlement treatment despite the fact that recovery was made on a claim that included damages for future medical treatment. In that sense, the claimant had been compensated for foreseeable future medical treatment in the settlement or verdict and would then also receive Medicare benefits when treatment was eventually provided. As a result, Medicare both failed to recover conditional payments made for past treatment and made payments for 5 Think of where the Internal Revenue Service would be without employer-filed W2 s.
7 mandatory reporting requirements, by timing and substance, provide Medicare with timely and detailed information that will enable it to more readily recover conditional payments for pre-settlement or pre-verdict medical care rendered to a Medicare beneficiary. The new information may also alert Medicare to compensation to a claimant that included some component for future medical treatment, thereby allowing Medicare to refuse payment for that treatment on the grounds that a primary payer has previously compensated the beneficiary for it. In some circumstances, particularly where Medicare makes a future payment and then later pairs that payment data with a previously reported settlement, Medicare may seek recovery from its beneficiary and/or the settling defendant; including the insurer and the insured. 6 The situation concerning future medicals (in other words, post-settlement payments) by Medicare for an injury that was the subject of a settlement is presently quite murky and will be covered under its own heading, below. The second addition to the MSP encourages RREs to make the new reports by providing for substantial penalties for failure to make timely reports required by the Section REPORTING REQUIREMENTS Who Must Report? As indicated above, starting January 1, 2011, with respect to settlements or judgments occurring on or after October 1, 2010, insurers and self-insureds (RREs) must report settlements and judgments relating to Medicare beneficiaries. 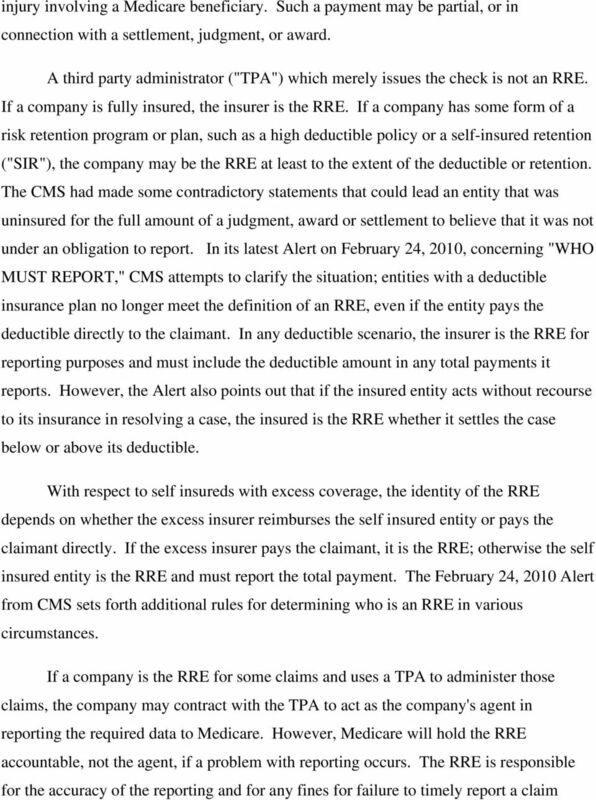 In the words of the CMS, an RRE is generally the entity that makes any payment for bodily or personal 6 See later discussion of US v. Stricker, a civil action recently filed against beneficiaries, insureds, insurers, and beneficiaries' (plaintiffs') counsel, for recovery of past conditional payments, among other things. 9 payment to Medicare in accordance with Section 111 reporting requirements. Any contractual agreement between the RRE and TPA should reflect the cost of the reporting function and who will be responsible for any fines for untimely reporting. 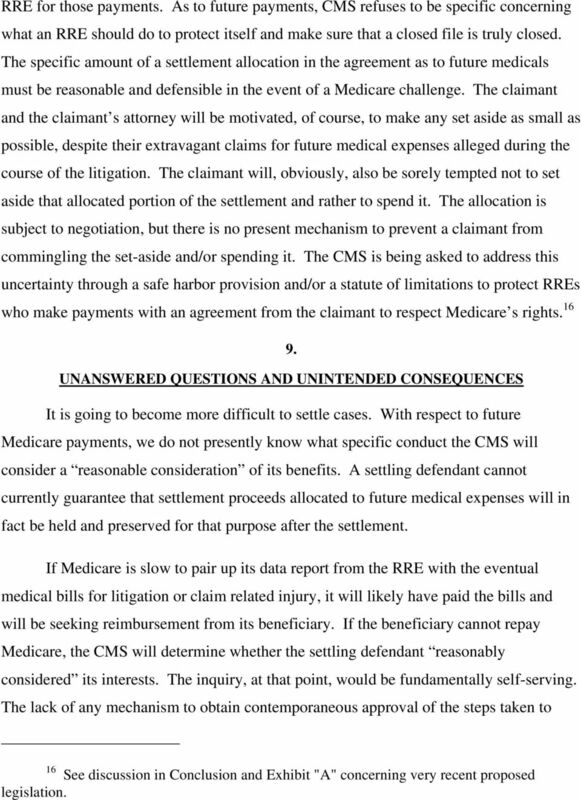 The important thing from the CMS s perspective is that the settlement or judgment gets reported. If an insured with a high deductible does not have written confirmation from its insurer that the claim has been reported, it should do so itself. 7 This is true even where the settlement or judgment was paid with no contribution from an insurer. From Medicare s perspective, the information that matters is the existence of a primary payer and the details of the payment. Medicare s interest in recovering payments is the same whether the primary payer is an insurer or not. 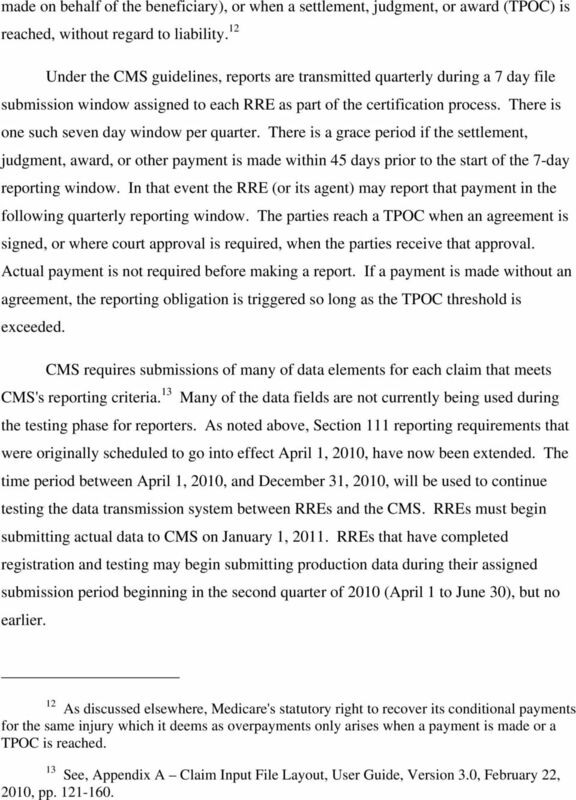 Triggering The Reporting Requirement As of February, 2010, CMS has delayed the first required production data submission by any RRE until January 1, For liability insurance policies, any kind of payment, subject to the limited thresholds set forth below, made to a Medicare beneficiary on or after October 1, 2010, for a claim or potential claim of personal injury, is considered a payment that triggers a reporting requirement under Section 111. Claims settled before October 1, 2010, do not have to be reported. Also claims with Ongoing Responsibility for Medicals ("ORM") 8 as of January 1, 2010, are reportable in any amount under Section 111. Claims with ORM closed administratively before this date are not required to be reported. 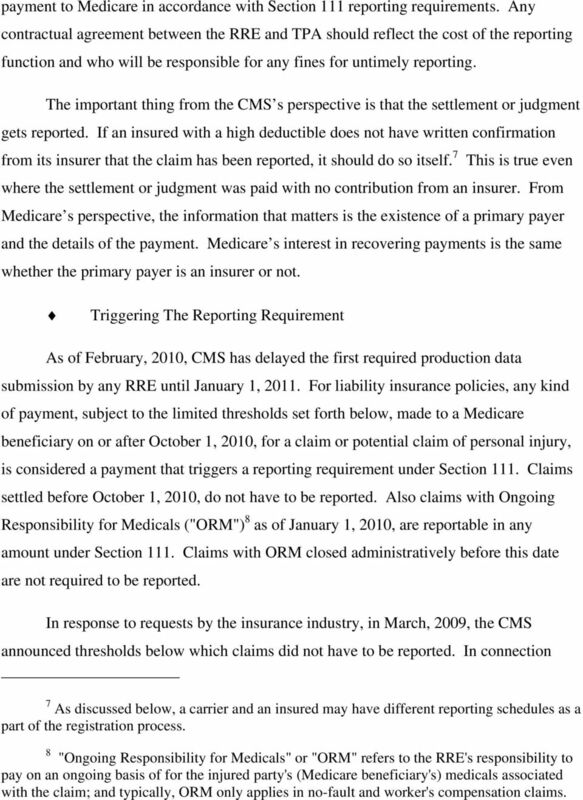 In response to requests by the insurance industry, in March, 2009, the CMS announced thresholds below which claims did not have to be reported. In connection 7 As discussed below, a carrier and an insured may have different reporting schedules as a part of the registration process. 8 "Ongoing Responsibility for Medicals" or "ORM" refers to the RRE's responsibility to pay on an ongoing basis of for the injured party's (Medicare beneficiary's) medicals associated with the claim; and typically, ORM only applies in no-fault and worker's compensation claims. 10 with delay of the initial reporting date, CMS also extended the threshold dates. Note, however, that important distinctions are made for claims involving a payment, labeled a "TPOC" (Total Payment Obligation to Claimant), associated with a settlement, judgment, or award, and a claim involving ORM after January 1, 2010, (the latter are all reportable). RREs and their attorneys should review CMS guidelines on this topic closely. There are also special exclusions for cases with ORM and thresholds for cases closed through settlement, judgment, or award, as illustrated by the following guidelines. Remember, as a general rule, where there is no settlement, judgment, award, or other payment, including no assumption of ORM, there is no Section 111 report required, until such an event occurs. Making a query to find out if a claimant is a Medicare beneficiary is not the same thing as reporting a settlement or judgment. 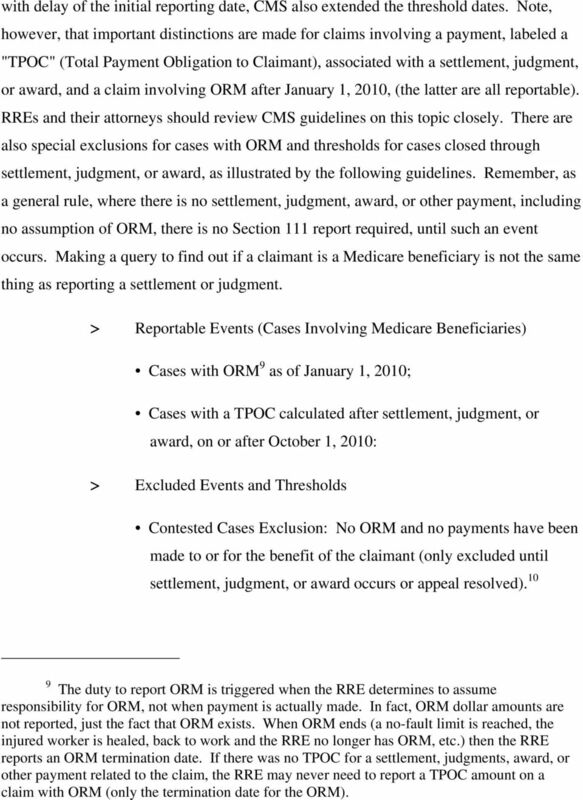 > Reportable Events (Cases Involving Medicare Beneficiaries) Cases with ORM 9 as of January 1, 2010; Cases with a TPOC calculated after settlement, judgment, or award, on or after October 1, 2010: > Excluded Events and Thresholds Contested Cases Exclusion: No ORM and no payments have been made to or for the benefit of the claimant (only excluded until settlement, judgment, or award occurs or appeal resolved) The duty to report ORM is triggered when the RRE determines to assume responsibility for ORM, not when payment is actually made. In fact, ORM dollar amounts are not reported, just the fact that ORM exists. When ORM ends (a no-fault limit is reached, the injured worker is healed, back to work and the RRE no longer has ORM, etc.) then the RRE reports an ORM termination date. If there was no TPOC for a settlement, judgments, award, or other payment related to the claim, the RRE may never need to report a TPOC amount on a claim with ORM (only the termination date for the ORM). 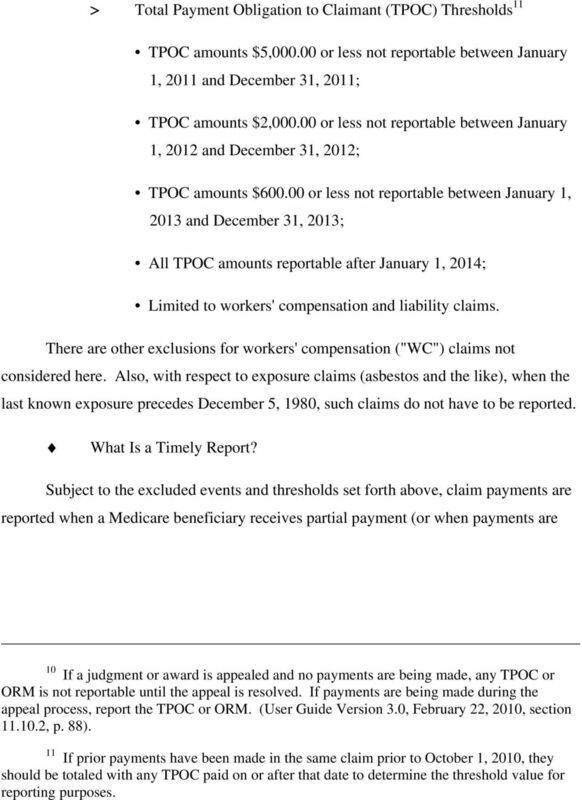 11 > Total Payment Obligation to Claimant (TPOC) Thresholds 11 TPOC amounts $5, or less not reportable between January 1, 2011 and December 31, 2011; TPOC amounts $2, or less not reportable between January 1, 2012 and December 31, 2012; TPOC amounts $ or less not reportable between January 1, 2013 and December 31, 2013; All TPOC amounts reportable after January 1, 2014; Limited to workers' compensation and liability claims. There are other exclusions for workers' compensation ("WC") claims not considered here. Also, with respect to exposure claims (asbestos and the like), when the last known exposure precedes December 5, 1980, such claims do not have to be reported. What Is a Timely Report? Subject to the excluded events and thresholds set forth above, claim payments are reported when a Medicare beneficiary receives partial payment (or when payments are 10 If a judgment or award is appealed and no payments are being made, any TPOC or ORM is not reportable until the appeal is resolved. If payments are being made during the appeal process, report the TPOC or ORM. (User Guide Version 3.0, February 22, 2010, section , p. 88). 11 If prior payments have been made in the same claim prior to October 1, 2010, they should be totaled with any TPOC paid on or after that date to determine the threshold value for reporting purposes. 13 7. FUTURE PAYMENTS It is clear that the CMS desires to make sure that a claimant is not both compensated in a settlement or judgment for anticipated future medical expenses, and also able to ultimately have Medicare pick up those same expenses when treatment is rendered. The manner by which Medicare will ultimately accomplish this is uncertain, and specific questions in this area, in particular, prompt we ll get back to you responses from the CMS. 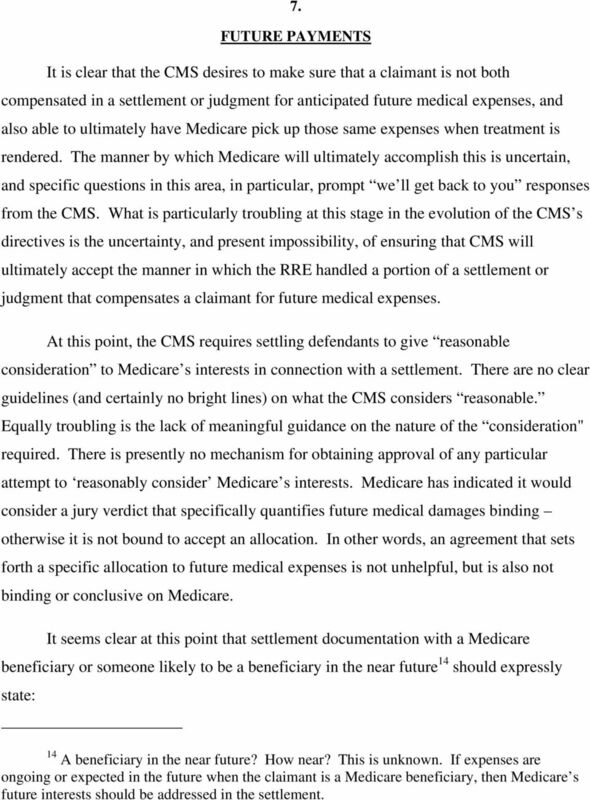 What is particularly troubling at this stage in the evolution of the CMS s directives is the uncertainty, and present impossibility, of ensuring that CMS will ultimately accept the manner in which the RRE handled a portion of a settlement or judgment that compensates a claimant for future medical expenses. 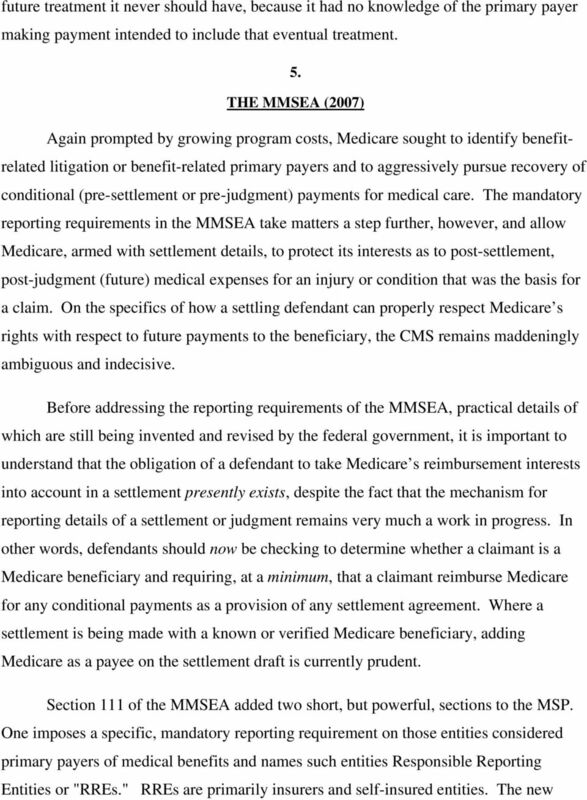 At this point, the CMS requires settling defendants to give reasonable consideration to Medicare s interests in connection with a settlement. There are no clear guidelines (and certainly no bright lines) on what the CMS considers reasonable. Equally troubling is the lack of meaningful guidance on the nature of the consideration" required. There is presently no mechanism for obtaining approval of any particular attempt to reasonably consider Medicare s interests. Medicare has indicated it would consider a jury verdict that specifically quantifies future medical damages binding otherwise it is not bound to accept an allocation. In other words, an agreement that sets forth a specific allocation to future medical expenses is not unhelpful, but is also not binding or conclusive on Medicare. It seems clear at this point that settlement documentation with a Medicare beneficiary or someone likely to be a beneficiary in the near future 14 should expressly state: 14 A beneficiary in the near future? How near? This is unknown. If expenses are ongoing or expected in the future when the claimant is a Medicare beneficiary, then Medicare s future interests should be addressed in the settlement. 14 A. That that the settling parties have considered Medicare s future interests and have sought to protect them; B. 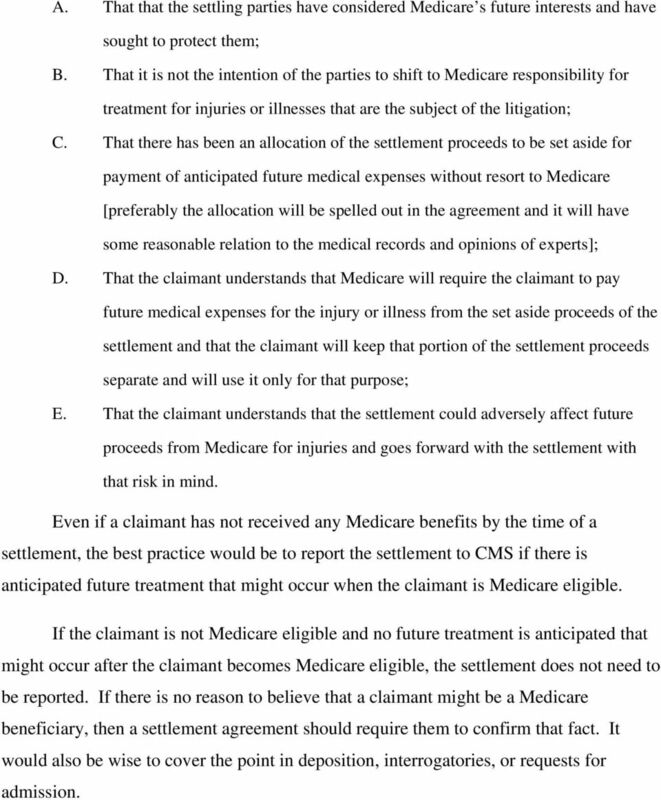 That it is not the intention of the parties to shift to Medicare responsibility for treatment for injuries or illnesses that are the subject of the litigation; C. That there has been an allocation of the settlement proceeds to be set aside for payment of anticipated future medical expenses without resort to Medicare [preferably the allocation will be spelled out in the agreement and it will have some reasonable relation to the medical records and opinions of experts]; D. That the claimant understands that Medicare will require the claimant to pay future medical expenses for the injury or illness from the set aside proceeds of the settlement and that the claimant will keep that portion of the settlement proceeds separate and will use it only for that purpose; E. That the claimant understands that the settlement could adversely affect future proceeds from Medicare for injuries and goes forward with the settlement with that risk in mind. Even if a claimant has not received any Medicare benefits by the time of a settlement, the best practice would be to report the settlement to CMS if there is anticipated future treatment that might occur when the claimant is Medicare eligible. If the claimant is not Medicare eligible and no future treatment is anticipated that might occur after the claimant becomes Medicare eligible, the settlement does not need to be reported. If there is no reason to believe that a claimant might be a Medicare beneficiary, then a settlement agreement should require them to confirm that fact. It would also be wise to cover the point in deposition, interrogatories, or requests for admission. 15 8. PENALTIES The penalty for failing to report a claim is $1000 per day, per claim. That does not seem terribly egregious until one considers what could happen if the report is more than 7 days late. The RRE would have missed its quarterly window to report, and cannot report the claim until the next one. The $1000 penalty could become a nearly $90,000 penalty, per claim, even if the error is promptly detected and the RRE attempts to comply, but cannot. The $1000 per day penalty, unfortunately, is not the sole adverse consequence that could result. The failure to consider Medicare s right to reimbursement of conditional (past) payments could lead to other penalties. If the claimant and/or the plaintiff s attorney does not honor Medicare s demand to be reimbursed for its conditional payments, Medicare can seek reimbursement from the claimant, the claimant s attorney, the defendant, and its insurer. 15 If the ratio of the settlement or judgment amount to the medical expenses paid by Medicare is high, a defendant could end up essentially paying the settlement twice. 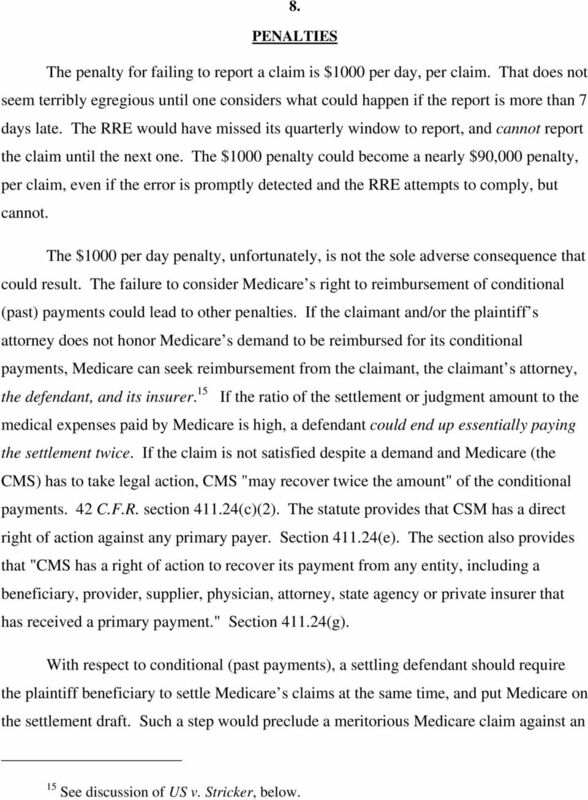 If the claim is not satisfied despite a demand and Medicare (the CMS) has to take legal action, CMS "may recover twice the amount" of the conditional payments. 42 C.F.R. section (c)(2). The statute provides that CSM has a direct right of action against any primary payer. Section (e). The section also provides that "CMS has a right of action to recover its payment from any entity, including a beneficiary, provider, supplier, physician, attorney, state agency or private insurer that has received a primary payment." Section (g). 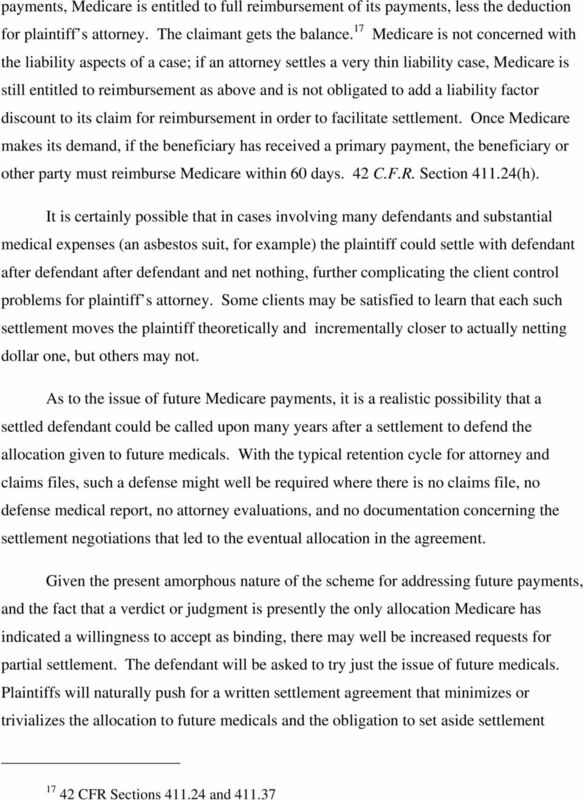 With respect to conditional (past payments), a settling defendant should require the plaintiff beneficiary to settle Medicare s claims at the same time, and put Medicare on the settlement draft. 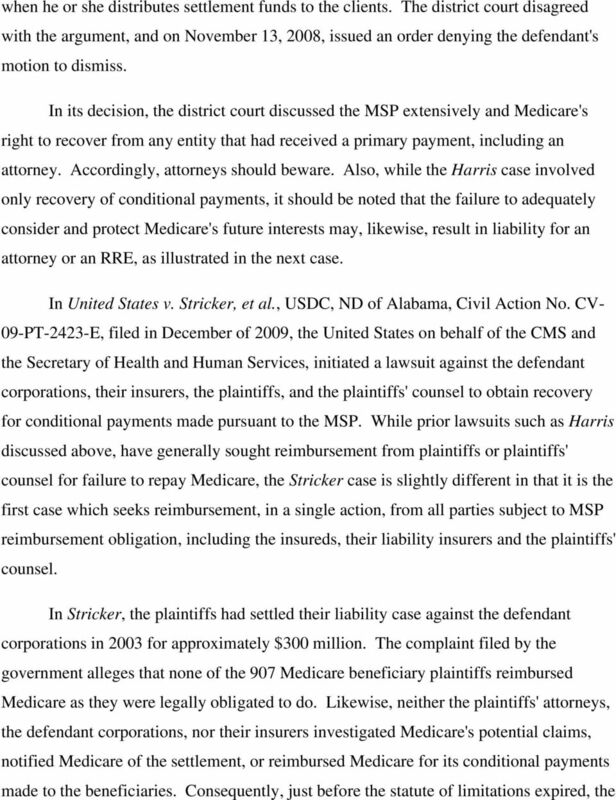 Such a step would preclude a meritorious Medicare claim against an 15 See discussion of US v. Stricker, below. 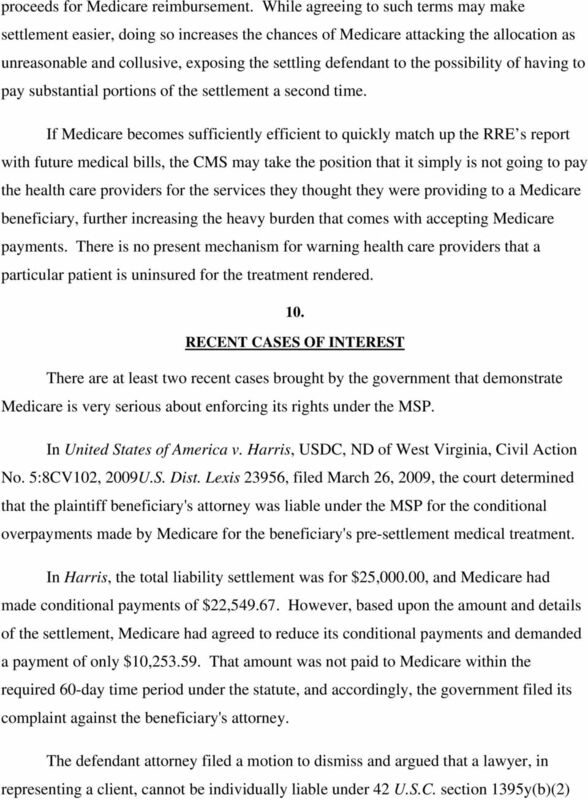 22 the amount of a Medicare recovery when a primary payment is made as a result of a judgment or settlement and CMS sues the party (beneficiary) receiving payment. 12. CONCLUSION As the foregoing discussion demonstrates, implementation of the new rules relating to the MSP has made settling cases with Medicare beneficiaries a more challenging and difficult process. Settlements will take longer and require the earnest cooperation of all parties to avoid running afoul of Medicare's enforcement provisions. The attorneys for both sides will have to engage in more leg work and information gathering to prepare for settlement. Without clear guidance from the CMS, the parties and their attorneys will have to do their best to account for consideration of Medicare's interests in any settlement agreement. However, with all of this being said, there is hope on the horizon for some clarification of the parties' responsibilities in satisfying Medicare's interests. As this article was being completed, the authors received word that a bill, H.R. 4796, 18 has been introduced in the House of Representatives. The announced purpose of H.R is to amend Title XVIII of the Social Security Act with respect to the application of Medicare secondary payer rules for certain claims. Based on a quick review, the bill, among other things, provides for: a calculation process for repayment of past conditional payments; establishing thresholds for reporting claims; establishing reporting requirement safe harbors; limiting the obligation of RREs to report beneficiary SSNs or HICNs; and establishing a three-year statute of limitations on any enforcement action brought by the government. Clearly, if the proposed bill is adopted, the prospect for successful settlements with a high degree of certainty will be considerably improved. 18 A copy of H.R is attached as Exhibit "A".